I am please to announce that I'll be crewing for my first time with Showmasters at LFCC next July. Thank you guys for giving me that opportunity ! Can't wait to meet you all ! For those who are crewing, Are you sleeping at the crew hotel or have you booked a room near earl's court in London by yourself ? > DavidB, pictures of your honeymoon lighted up my days !! Usually it's a mixture for crew - a lot do stay at the crew hotel, and some have their own arrangements (either hotel or they are locals). I will stay in Crew hotel :) Can't wait to meet you all !!! 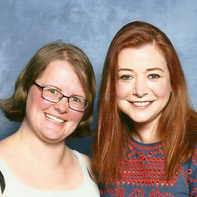 Sorry, but LFCC will be my first time as a crew member, how does it work if I want to buy more autogrpahs/photoshoots ? Do I have to buy them via the online shop ? Or do I have to wait and buy them on the day? You can still buy photoshoots online like anyone else, or pay for autos at the guest table. But be sure to make sure that you have enough time in your points-per-day allowances to get them. Well, in fact it depends on how the timetables are made. I am off on Sunday afternoon, but if there is no photoshoots or signings, no need to buy them then! How were the past timetables made for previous LFCC ? There's shoots/autos throughout the entire weekend usually. Another new face here - looking forward to LFCC! Can anyone help me with access to the Crew secure area and/or the FB page? Looking forward to getting to know some folks before I rock up in London. It's gonna be ace. But i was selected to crew and replied to the most recent confirmation email sent out, are they known for doing the final confirmations by email or calling you? just someone rang my house but wouldn't leave a message and i thought it could be regarding crew. Once you reply to the confirmation email that's it. All you'll get after that is the hotel confirmation if you asked for a room. That confirmation is your "YOU ARE CREWING" email. We don't ring people. Up until 10 days before the start of the event you can indeed email updated requests about vouchers. Me neither! It'll be a blast. I'm looking at the True Believers Comic Awards - can anyone tell me if we need tickets for this, or are our crew t-shirts enough? You will need a ticket. The hotel confirmation tells you (if you asked for a crew room) what hotel it is, confirms the nights you are staying, and tells you who your roommate will be. It also usually has times for when the crew busses will be leaving the hotel in the morning.